Things have just got interesting in the race for the 2016/17 EPL title. Top football tips today sites still have Chelsea as the favorites but their odds have dropped in recent weeks. Bookies thought they had done enough to win the league due to them having a ten point gap over closest rivals Spurs in second but that all changed last weekend. The Blues have taken their foot off the pedal and that is one thing you can not do in the Premier League. They suffered a shock defeat to Crystal Palace and were beaten by Manchester United 2 - 0 in their last outing. Now the gap only stands at four points and the two teams face each other in the FA Cup semi-final in their next match. Spurs have won their last seven matches in the EPL and they last two they have won 4 - 0. On current form, they are by far the best team in the division and have dominated their opponents. It was this time of the year last season that their title race fell apart but this time around they are showing signs that they have learned. What makes their recent stats even more impressive if that they have managed their unbeaten run without star man Harry Kane out injured for most. Dele Alli, Son, and Erickson have all been in fine form and if they can keep this momentum they could catch the Blues before the season is out. 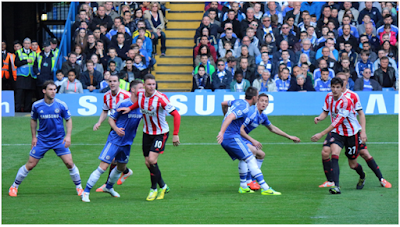 The next match for Chelsea is vital and it is going to be tough as they face Southampton. The Blues have home advantage but if the Saints can follow Mourinho's blueprints on how to beat them, they can get the result. The Special man marked Hazard out of the game which resulted in the Blues not having a single shot on target. Spurs have an eight-goal advantage over Chelsea which is like having an extra point. If the gap closes to a single point, momentum could take Spurs over the finish line. The next two matches in the EPL for Chelsea are the toughest they have left on paper. After Southampton, they face Everton away from home. Once these two games have taken place it will be a huge indicator who will finish in first place. Spurs still have Arsenal and Manchester United to play but both games are at White Hart Lane where their form has been impeccable. With the FA Cup semifinals taking place this weekend the two title rivals will want to get an upper hand over the other by knocking them out of the FA Cup. The winning has an excellent chance of doing the double this year. In the other semifinal, Arsenal faces Manchester City so it is going to be an entertaining final whoever makes it. The best free football tips sites all have a different opinion as to who will come out on top. I am picking Spurs due to current form and the fact that Harry Kane is back and already scoring. Tottenham did not make their dreams come true last campaign but they are older, wiser and better than they were. My football tips for today are to pick them to win the EPL and FA Cup double ! !